As per the recent race names vote at Wowpedia talk:Writing policy#Race name case, the correct race name spelling is "troll" and not "Troll"
10 Sick of ignorant players labeling them as evil. 11 Joining the Horde- worst idea ever? 12 Other races to join Horde? 13 Troll Crest - all trolls or just Darkspears? 21 Is it worth adding troll evolution? Every time I visit a page, there is no disscussion. Why? I'd say odds on are that they are related at some point. I thought I'd throw out something historical here. I know that according to a lot of WoW info Trolls are canabals. Just as a note, the notion of savage groups of people slaughtering humans for food is pretty much the subject of legend. Canabalism typically involved the eating of a small part of an honored dead's body in order to carry their spirit forward. This is probably what most Trolls practiced. Just thought I'd throw that to the wolves. Because both races were in Kalimdor at the same time, there is a possible relation. Not to mention that it says (somewhere, sorry forgot) that a group of trolls went to settle by the lake in the center of the continent, aka the night elves. BTW bridgettebeneshe sign your post w/ four ~s in a row w/ no spaces. —The preceding unsigned comment was added by Okolorion (talk · contr). Every Troll before WoW used throwing weapons, except for one spellcaster (the Witchdoctor). Maybe put the playable trolls into "Island Trolls" category - I don't remember having any other troll tribes except Darkspears being Island Trolls. You can have then have "Trolls" page as general, or redirecting to "Island Trolls", and general info to "Trolls (general)" or something similar. 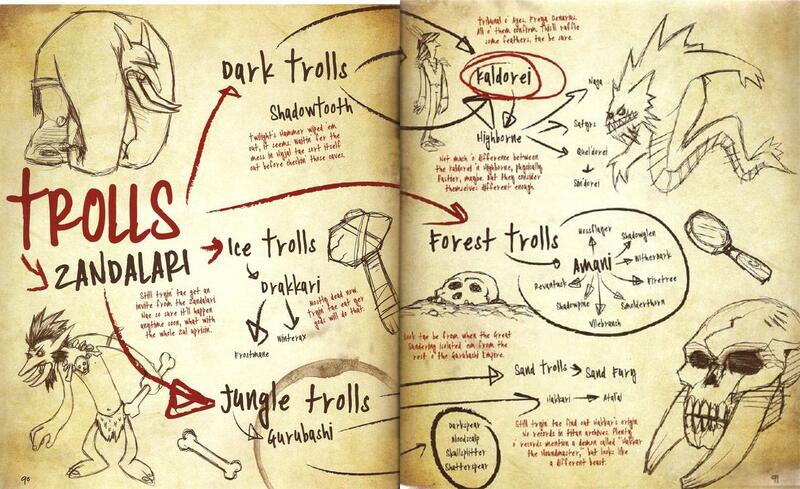 It could of course be still "Darkspear Trolls", as they are even more appriopriate, but if Island Trolls was used, we could leave Darkspear to the Lore. Or the other way. Why are sand trolls in misc. as Sandfury trolls. In the troll compendium that Blizzard released, it states that the race is called Sand trolls and that Sandfury is a tribe, not the race itself. I think this is quite a big mistake lore wise and it would be nice to edit. Maybe even their own little space at the bottom of the page (the table thing). The RPG books also mention that female trolls can prove themselves, move beyond the limits of society's gender stratification system as well. Sick of ignorant players labeling them as evil. Joining the Horde- worst idea ever? Is it just me, or have the Darkspears had pretty much the worst time ever since teaming up with the greenskins? Darkspears are certainly of capable of taking care of themselves. They have a nice villiage in Sen'jin,Desolace,Zangermarsh,and Stonetalon. They could easily make it out for themselves. The reason they stay with the orcs is sheer loyalty,there are few races with as a great bond as orcs and trolls. Well, -The Darkspears were at war with the Alliance anyway, and were losing due to numbers, -All the other Jungle Trolls hated them anyway. -Zalazane has been dealt with over the course of WoW. -Most of the Darkspears didn't fight in the Third War, the main bulk of the tribe, Including Vol'jin didn't arrive at Kalimdor until a year after Thrall did, by which time the war was over. -The addition of the Forsaken and the Blood Elves, neither of which they wanted, has doubled Horde's numbers, lessening the Alliance's advantage. Other races to join Horde? Troll Crest - all trolls or just Darkspears? The number of species has varied between 3 to 6 most of the time. The main traditional five are forest, ice, jungle, sandfury (desert/sand trolls), dark trolls. Sandfury are sometimes said to just be a small offshoot of one of others, and dark trolls are sometimes said to be small offshoot of one of the others. With those two eliminated it cuts it down to three. Zandalar trolls are considered the progentor race. Okay so who do you think was closer to the right answer: Medivh or the Kirin Tor? They both had a lot of knowledge to think upon; although Medivh was corrupted at this point. Also, were any of those troll races you mentioned found after the events in the book ended? Exactly how do trolls and troggs have similar stature? Look at them and they are nothing alike. Also nowhere is it said that ALL races started off as metal/stone constructs - only the ones created by the Titans. I've never seen anything that might link trolls to Titans, so it's entirely possible that trolls were one of the first races to evolve of their own accord. Anyway name similarities don't guarantee a relation - trogodon's have a similar name too but it's clear that they are not connected. I’ve found this cobra head in the Grimesilt Dig Site, I think it’s clearly a Gurubashi Empire ruin, but it’s very far north than the usual area where the Gurubashi expanded. What do you think, Early Gurubashi, Later Gurubashi, Amani empire ruins? The dwarf is Dorius Stonetender. Is it worth adding troll evolution? This page was last edited on 2 March 2017, at 12:05.